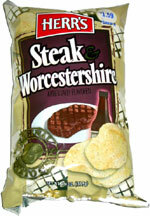 Taste test: These chips do taste like a steak, along with some worcestershire sauce poured on them. 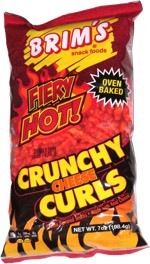 The chips are not greasy, although there is a lot of powder on them that will cause you to lick your finger. Vegetarians beware! These will leave a beefy aftertaste in your mouth after you eat a few. Although we don't think there is any actual beef or steak in the chips. Smell test: Hard to place aroma, not very powerful, but not obnoxious. Trivia: The city of Worcester, Mass., is pronounced (wuh-ster), not (wor-ches-ter).